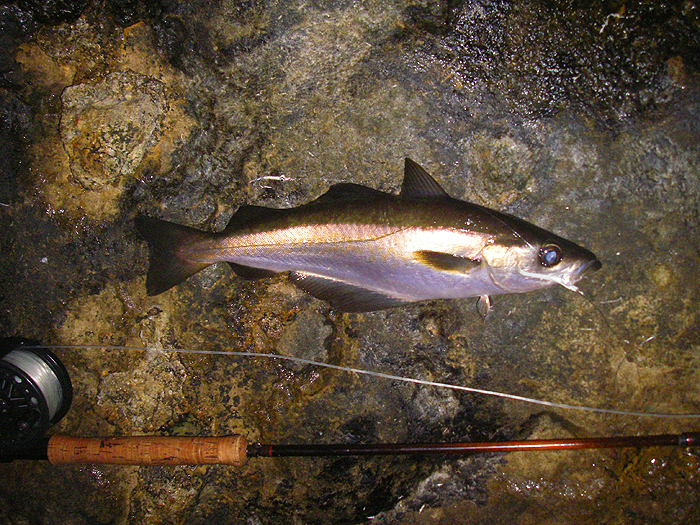 I followed up the pollack fishing mentioned in the last saltwater page with another trip the next morning (always a good idea). 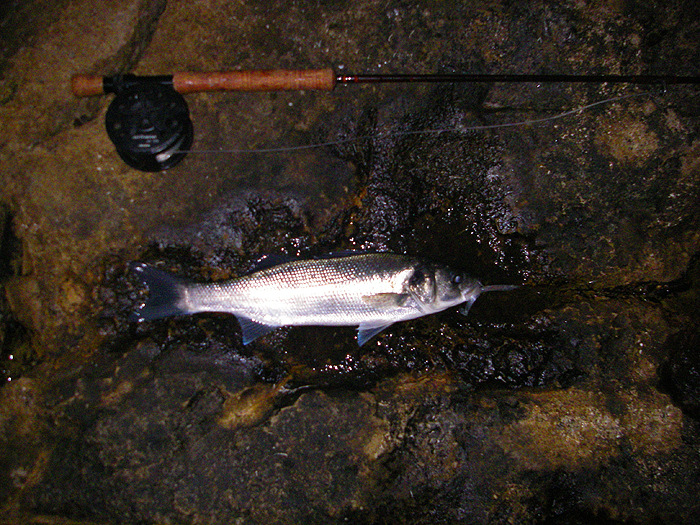 This time I simply fly-fished (although the spinning rod was handily placed - just in case). It was a bit rougher than the previous trip and I was slightly apprehensive but all was well. As soon as the sky in the east began to lighten the fish started to bite and pollack after pollack grabbed at the small redgill on my fly gear. Many of them were decent fish and gave me a fair tussle in eight feet of water and five feet of kelp. 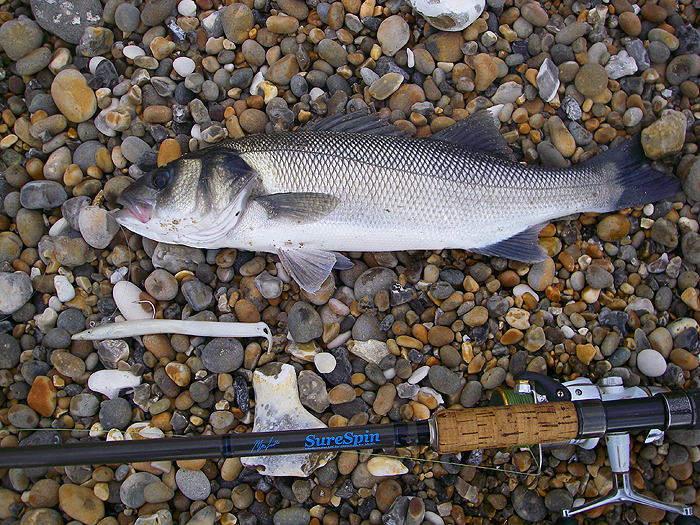 Towards the end of the session I had a mackerel and then a bass, both of which were even livelier than the pollack. That afternoon my old pal Dave Elliott visited and was intent on trying to catch a bass. 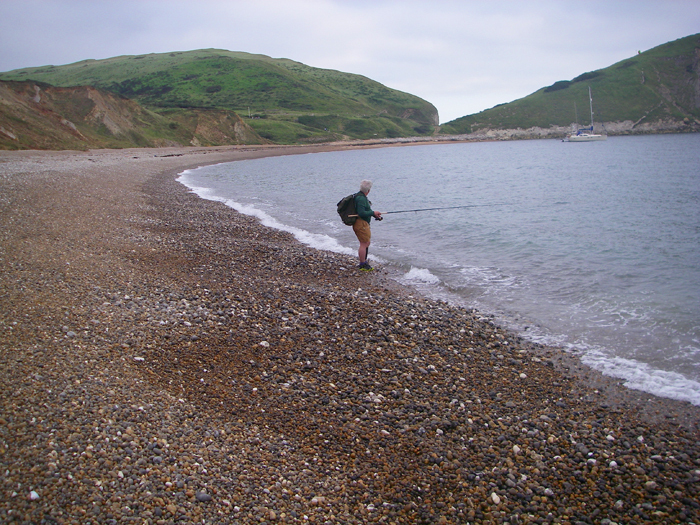 I wasn't sure where to go (mid-afternoon, low water, gin clear) but we opted for Worbarrow Bay, because it's a nice place. It was more or less dead as far as we could tell but Dave has never caught a bass or indeed seen one landed so it was a pleasant walk. We hiked to the far end of the beach and spun our way back with plugs and soft plastics. We were encouraged when we noticed flocks of gulls on the water but it turned out that they were eating flying ants trapped on the surface. After an hour or two of solid casting suddenly I had a bite which turned out to be a bass of three or four pounds - Dave was thrilled. Then, that was it, but we enjoyed the afternoon. When I got home the phone rang and it was Nigel suggesting that we had another go at fly fishing the following morning. I couldn't resist so as it got light we were standing on the rocks flicking our flies into the sea. 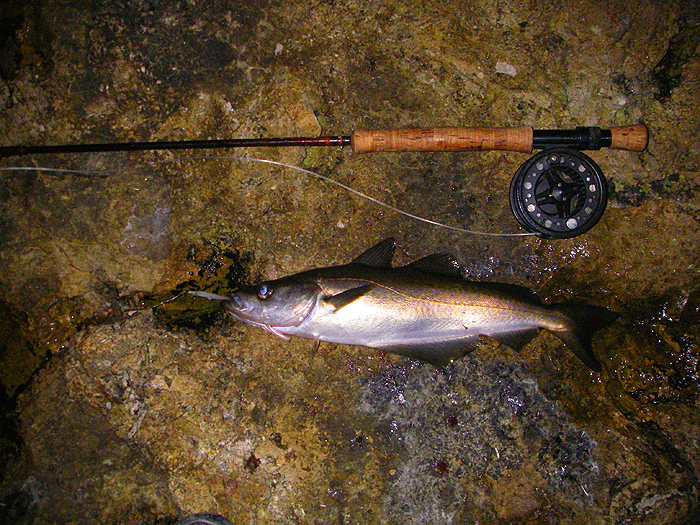 I'd switched from the 4" Redgill of the previous day to a small silvery Clouser and a tiny, white Delta (the mackerel that I'd caught coughed up lots of tiny, inch-and-a-half whitebait). It certainly worked and after the fish got going we landed about (we lost count) sixteen mackerel, eight pollack and six bass between us. We missed and lost quite a few more so for an-hour-and-a-quarter session it was pretty hectic.